After spending a day in the bambini's classrooms (remember to mail in your ballot for prop 405 by tomorrow!! 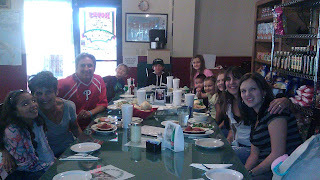 )...they had built up and appetite...we swung by to pick up Lexy and Breanna...then out to get Cody...and off to Viro's...Italian Wedding Soup Day!! I distinctly remember as a child, a commercial for Prince spaghetti...In it, a little boy comes flying up outside of his row home, skids to a stop yelling "Mama, mama!! What's for dinner?" "It's Wednesday!" came the reply from an open window high above the street..."Prince spaghetti day! "...well, here, it's Thursday, Italian Wedding Soup day!! Later, our old neighbors, Cindy and Derek Peske stopped by with their children, Ryan, Maranda and Aaron, in Tucson visiting from Georgia. They lived across the street from us in our old 'hood. We went through the whole story of how we met Angie's daughter, Janene, about 17 years ago and subsequently meeting the rest of her family and getting adapted. Halloween, 1995, our first in our new home...the doorbell rings, Kimmy shouts "Dave!! Our first trick-or-treaters!!" I raced to get the camera...opened the door to find Cindy, Derek and Ryan, just a toddler. Cindy remembers that Kim had made these little elaborate bags of candy, tied with orange raffia and a bow!! "from that moment, I knew this woman makes people feel special...even little children." she told me. Especially children!! Cindy said she immediately thought 'Wow, how am I going to live up to her expectations?" But, the beautiful thing about Kim, was, she had no expectations for anyone...she just really wanted to make everyone smile and to feel good. Years later, Cindy remembered, she ran into some problems and was running late to pick up her children...Ryan was in 5th grade, Maranda in 3rd. She was panicked, because she had just begun to let the kids walk home alone and knew they did not have a key. "I was running late...I was sweating bullets...and never wanting to be a burden on anyone, I didn't have back up plans with neighbors or anything...I was so worried...driving so fast down Houghton to get to my kids...praying for safety. I get home and there is a note tapped on my front door from Kim; "Cindy, don't worry. Ryan and Maranda are with me at my house, Kim Conca" I just about collapsed with gratefulness. I walked over to your house and was embarrassed to be late, thinking I was a horrible mom and thanking Kim over and over again. She was so KIM-like and was so kind, saying it was no big deal, not to worry and let her know if she ever needed anything." Another memory that the Peske's had, was inviting us to a party and Kim showing up with a platter of deviled eggs and a pitcher of lemonade. Cindy told her that she didn't have to bring anything and Kim told her 'don't be sillly! You are a family of five, I have to help out.' Cindy thought that was just so sweet and thoughtful and told me that from now on, any parties she goes to, in Kim's honor, she will bring a pitcher of lemonade, because, she bets that Kim will just know that and smile down through a ray of sunshine. The Peske's remember Kim's smile and infectious laugh, too. "It was a busy day at St. Joseph's for Kim! This morning, her oncologist, Dr. Taetle, felt she was ready for chemo and ordered her to begin treatment at 10 a.m. A nurse came in at 10 and activated Kim's porto cath, an implant on the left side of Kim's chest, where, going forward, Kim will receive her chemo treatments and they will also be able to draw blood samples. Around 11, she received Alimta. This only took 10 minutes and then around noon they gave her Paraplatin, which took about 2 hours. She did incredibly! All smiles and no reaction. The nurses told her patients typically experience a rash and nausea during or shortly after treatment. She may still see some side effects in the coming days, but is ready to face them. Afterwards, she received two pints of blood, as she was anemic. Before I left, her nurse expressed concern that the amount of her blood coming out of her drain needed to be monitored and said she would notify the Dr. if the level was too high. We will consult with the Dr. in the morning to see if another ultra sound needs to be done. Kim says, the outpouring of goodwill has made her glow and her new nickname is 'firefly'. Today, she also told me she knows that she is going to get well. She knows it may take a long time, but she believes that if it was her time to go, God would have already taken her with one of the blood clots in her lung or leg. She says she knows what she has to do and this is her journey for now, but God still needs her here to do His work. Once again, in case I haven't told you this before, she is the most amazing person that I have ever met. And all of you are helping her continue to be amazing with your love, support and prayers.